UNIVERSITY PARK – Penn State University Police are investigating multiple thefts which occurred in Pinchot Hall sometime between 1 a.m. April 14 and 1:30 p.m. April 15, in which multiple wallets and their contents valued at more than $1,350 were stolen. A witness described the suspect as a white male, approximately 6 feet tall, with short “dirty blond” hair, thin build, wearing a light gray colored baseball cap on backwards, a light colored gray hoodie and dark colored sweatpants. In October of 2011, University Police investigated similar incidents involving the unknown male pictured here and believe the cases may be linked. Anyone with any information regarding the thefts in Pinchot Hall or to the identity of the male pictured here should contact University Police immediately at 814-863-1111 or Centre County Crime Stoppers at 1-877-99-CRIME. Anyone providing information that leads to an arrest may be eligible for a reward up to $1,000 from Crime Stoppers. 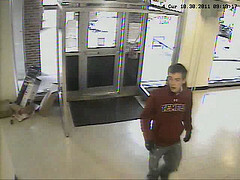 Anonymous tips can be submitted at http://www.police.psu.edu/witness/ online.